Use as a final project after doing reading and research about hydrothermal vents along mid-ocean ridges. First of all, you don’t have to copy exactly what I did with my class. You can adapt this idea any way that suits you. 1) The way we did it was to paint the background first. Use black and brown acrylic paint tinted slightly with white, and instead of a brush, use a small piece of sponge to dab on the paint. The sponge will make it easy to get a rock-like texture. Older students might want to try to make them look round. The main thing is to keep the colors dark so they look like they are set back into the picture. You could try making a slightly lighter one and seeing if it looks closer. 2) When paint is dry, put some chalk or white pastel on your finger and smudge it around above the vents to make it look like smoke coming out. 3) Crinkle up the black tissue paper to form a foreground of another smoker tower, plus make some rocky landscape. Use photos as your guide. Secure with white glue. 4) You can use stretched-out pieces of cotton ball for smoke coming from near vents. 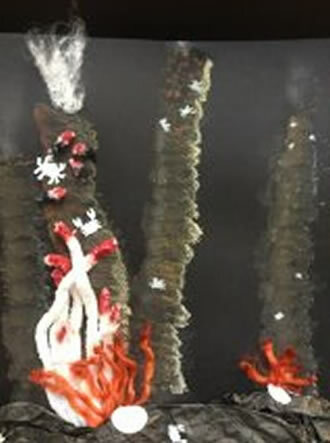 5) Use whatever yarn/felt bits you’ve supplied to make large tube worms and smaller Jericho worms. 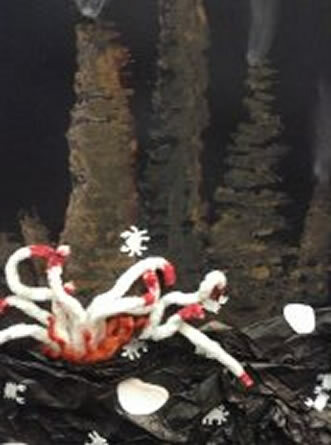 I used thick fuzzy yarn for the large worms, you might have a better idea. Cut out tiny paper clams to put around the base of your foreground smoker. 6) If you want to add crabs, you can draw them in with a white pencil or you can paint some with white paint, or you can do what I did and go to the bother of buying a crab paper punch (I used ebay) and punching out tiny paper crabs. The punch was GREAT but probably only worth getting if you have a fair number of kids. NOTE: Most vent animals are white or close to white. 7) You can add vent snails if you’ve read about them. Or scale worms, which would be pretty small. A few vent communities have a small octopus. Read and research to find out more. 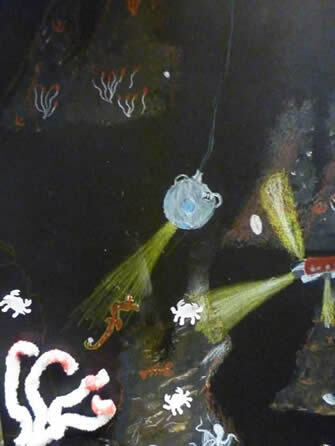 This student added some ROVs with lights.